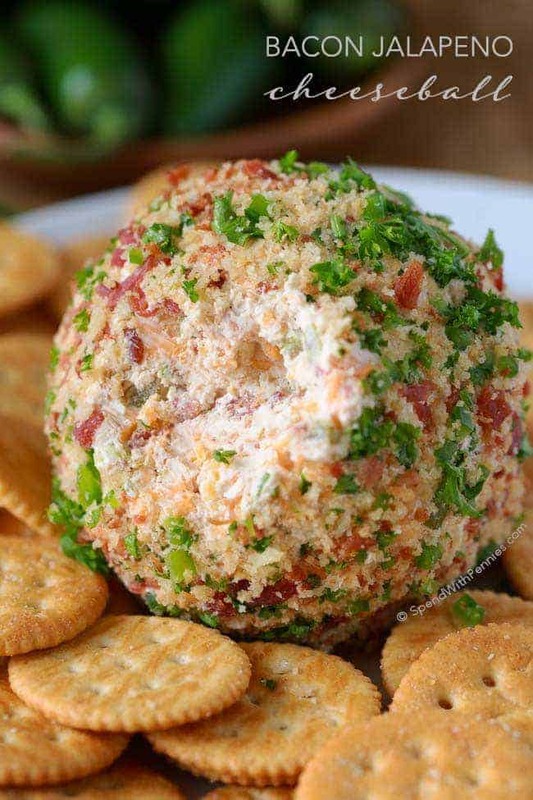 This Bacon Jalapeño Cheese Ball recipe is easy to make and a hit at every party. 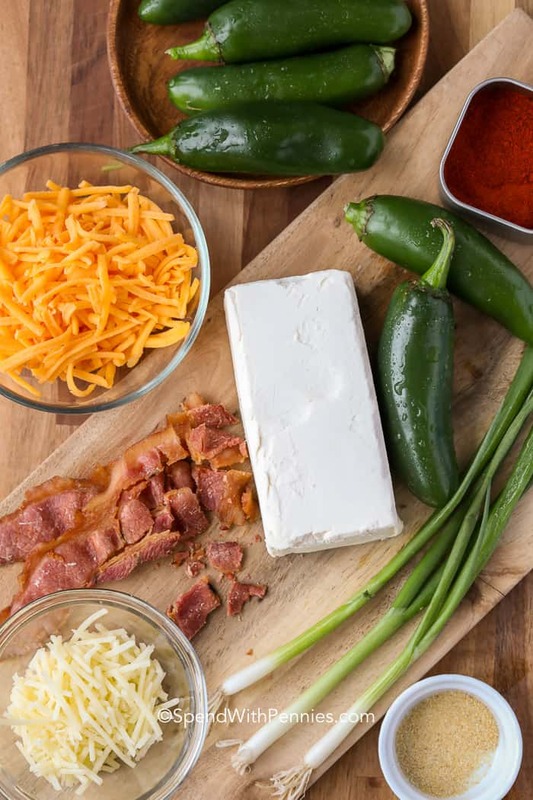 A creamy base is loaded with crispy smoky bacon, spicy jalapenos and sharp cheddar for a perfect party snack. Making a cheese ball recipe is easy and best when made ahead of time. This is perfect for any party! Cheese balls have been a classic appetizer at parties for as long as I can remember! I always tend to move towards the savory snacks at a party and cheese is at the top of my list. 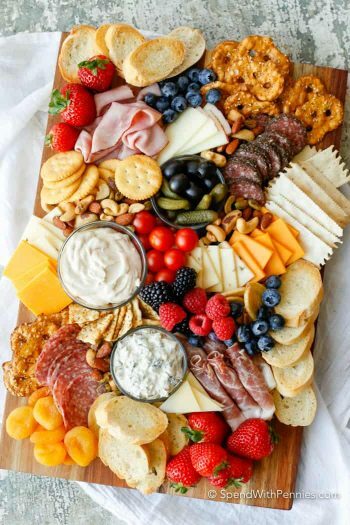 If I see a cheese ball, you can pretty much guarantee I’m somewhere nearby with a glass of wine sneaking way more bites of cheese than I would care to admit. There’s just something so irresistible about that rich creamy cheese and with this recipe adding in crispy bacon and a little heat makes it totally irresistible! Believe it or not, for years I bought cheese balls to serve at parties. I actually had no idea that they were so easy to make! 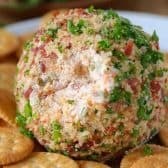 Jalapeno Popper Dip is one of the most popular recipes on my site (there’s a good reason it’s been pinned over a million times) so I decided to take those same delicious flavors and use them in this cheese ball recipe… and add some bacon. You’re welcome! This is the perfect cheese ball recipe with a rich creamy base and lots of sharp cheddar to add that delicious cheesy flavor we all love. The canned jalapenos add a pop of spice while the bacon adds a smoky salty flavor. When making a homemade cheese ball, I mix the cream cheese and seasonings with a hand mixer until fluffy as I find this makes the best consistency and softens the cream cheese. Once you stir your other ingredients in, you’re going to wrap your cheese ball in plastic wrap and refrigerate at least one hour. At this point, you can actually leave this cheese ball in the fridge for up to 4 days making it the perfect choice for your weekday potluck! You’ll want to roll the cheese ball in the topping on the day of serving. We serve this with crackers, crostini or fresh veggies as dippers! 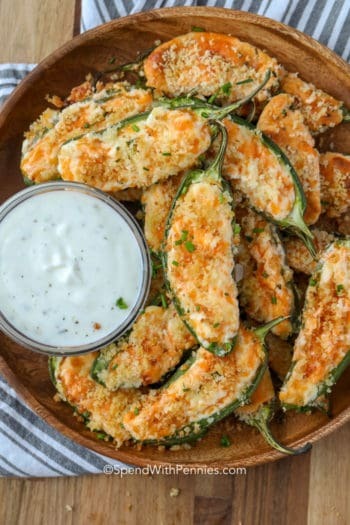 I love leftover cheese balls, they can be used for so many things! Of course you can freeze it and serve it again for another party. I love to put the leftovers in a pan and melt them to add to Roasted Broccoli or pour over Grilled Asparagus. 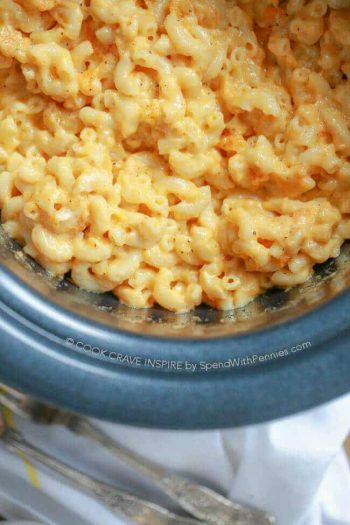 I also add a bit of heavy cream and melt the cheese ball down for super easy mac and cheese or pasta sauce! The Best Spinach Artichoke Dip – So good and creamy! Cheesy Hamburger Dip – The best cheeseburger flavors! The BEST Buffalo Chicken Dip (video) – Reader Favorite! This Bacon Jalapeño Cheese Ball recipe is loaded with crispy smoky bacon, jalapenos and sharp cheddar for a perfect party snack. Mix cream cheese, mayonnaise, garlic powder, paprika and Worcestershire sauce with a mixer until fluffy. Stir in cheese, bacon, green onion and jalapenos. Place mixture onto a piece of plastic wrap and roll into a ball. Refrigerate at least one hour. Combine Panko bread crumbs and butter in a small pan. Heat over medium heat, stirring until lightly browned. Cool completely. Combine all topping ingredients. Roll chilled cheese ball in topping pressing to stick. Serve with crackers, tortilla chips or vegetables for dipping. I’m pretty strict low carb so I made this with everything but the panko. So good. Thanks!!! So glad you loved it Missy! Missy, you can check out Holly’s Easy Low Carb website for more low carb recipes! On top of the Panko bread crumb topping did you use parsley or cilantro. Thanks…can’t wait to try it. The green in the topping recipe ingredients is parsley. You’ll love it Eva! Made this for Christmas appetizer. My we ate the entire thing in one sitting. So yummy!!! Made for Christmas Eve appetizer it was hit this cheese ball is different from the traditional oh hum cheese ball. Highly recommend for all occations. 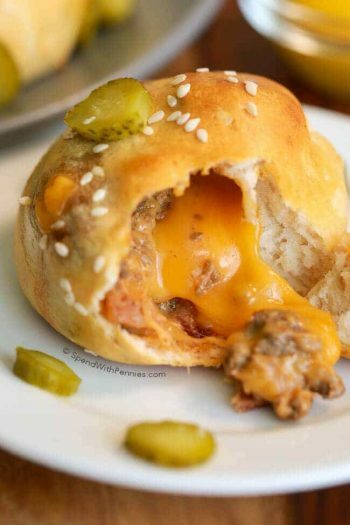 If I wanted to make cheeseball bites (with pretzel stick) should I leave the outside topping the same or modify it any way? Thanks!! Yes, pickled jalapenos are perfect in this recipe. At the store I saw canned “chilies “ in water) and canned “jalapeños” in a vinegar brine. Which would be best to use? I did not see canned “jalapeños” in water. Thanks! The canned chilis are generally very milk. The jalapenos have more spice and are what I use in this recipe. 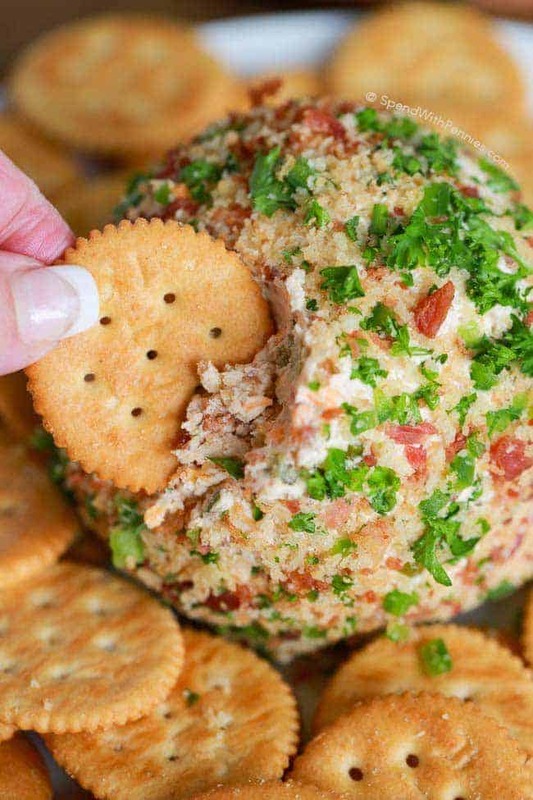 I want to try this but can you use fresh jalapenos instead of canned jalapenos for inside the cheese ball? You can certainly use fresh jalapenos. They have a little bit more crunch. If you don’t want them to be too spicy you may want to remove the seeds/membranes. Made this for a baby shower – followed the recipe precisely and it was AMAZING. It’s truly addictive. Was concerned it might be too spicy but it’s not. Utterly delicious – was a huge hit. I will definitely make it again. It’s delicious! Absolutely worth making! I have commented on Facebook but have not received a response, so I’ll try here. The recipe calls for a tablespoon of butter for the topping to this cheeseball. In your video, you do not mix it in with all the other topping ingredients. Butter for the topping seems a little out of place to me. Is this a mistake, or is the butter included in the topping? In step 1 of the topping, the butter is added with the Panko crumbs and toasted. The ingredients are listed above. 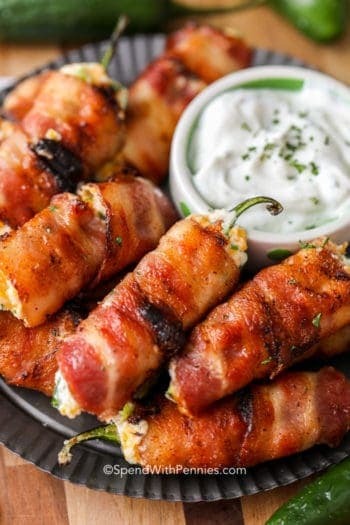 I think the Bacon Jalepeno Cheeseball looks great and just may try it for Christmas eve! I love Cheesebals and dips and all that fun stuff. THanks a bunch!